A team of astronomers at the Friedrich Alexander University led by Péter Németh has discovered a binary star moving nearly at the escape velocity of our galaxy. There are about two dozen so-called hypervelocity stars known to be escaping the galaxy. While all of them are single stars, PB3877 is the first wide binary star found to travel at such a high speed. Additionally, the results of the new study challenge the commonly accepted scenario that hypervelocity stars are accelerated by the supermassive black hole at the galactic center. The findings are being published in the Astrophysical Journal Letters today. The team, in collaboration with researchers from the California Institute of Technology, showed the binary cannot originate from the Galactic Center, and no other mechanism is known that is able to accelerate a wide binary to such a high velocity without disrupting it. They therefore hypothesized there must be a lot of dark matter to keep the star bound to the Milky Way galaxy; or the binary star, PB3877, could be an intruder that has been born in another galaxy and may or may not leave the Milky Way again. PB3877 was first reported to be a hyper-velocity, hot compact star, when it was discovered form the Sloan Digital Sky-Survey (SDSS) data in 2011. New spectroscopic observations were done with the 10 meter Keck II telescope at W. M. Keck Observatory on Maunakea, Hawaii and with the 8.2 meter Very Large Telescope (VLT) of the European Southern Observatory (ESO) in Chile.Caltech astronomers Thomas Kupfer and Felix Fürst observed PB3877 with the ESI Instrument fitted on the Keck II telescope. "When we looked at the new data, much to our surprise, we found weak absorption lines that could not come from the hot star," Kupfer said. "The cool companion, just like the hot primary, shows a high radial velocity. Hence, the two stars form a binary system, which is the first hyper-velocity wide binary candidate." The surface of the hot compact star is more than five times hotter than the Sun, while the companion is a thousand degrees cooler than our Sun. The system was determined to be 18,000 light years away. The mass of the hot compact star is only half of the mass of our Sun, and the companion is .7 times the mass of the Sun. "We studied hyper-velocity stars since 2005, the year of discovery of the first three," said team-member Ulrich Heber. "In the meantime about two dozen have been found, but all are single, none has a companion directly visible in its spectrum." The center of our galaxy hosts a supermassive black hole that can accelerate and eject stars from the galaxy by disrupting an original binary star. Hence, most hyper-velocity stars are believed to originate from the galactic center. "From our calculations we can exclude the Galactic Center as the place of origin, because its trajectory never came close to it," said team member Eva Ziegerer, specialist in stellar kinematics who collected the astrometry data and reconstructed the orbit of the binary. "Other ejection mechanisms, such as stellar collisions and a supernova explosion have been proposed, but all of them would lead to the disruption of a wide binary." "PB3877 may be an intruder from another galaxy," Németh said. "In that case its prolonged gradual acceleration would not harm its integrity. The outskirts of our Galaxy contain various stellar streams that are believed to be the remnants of dwarf galaxies that were torn to shreds by the strong tidal force of the Milky Way." Unfortunately, the available data do not allow to make a connection to any of the known streams. Therefore, the origin of the binary remains unclear and so is its future. Whether or not the system remains bound to the Galaxy depends on the amount of dark matter in the Galaxy. Therefore, the mere existence of this binary puts pressure on our models and on our current understanding of dark matter in the Milky Way. "We used different mass models to calculate the probability that the star will actually remain bound to the Galaxy. Only for the most massive Galaxy model this is the case. This makes PB3877 an excellent target to probe dark matter halo models," said Andreas Irrgang, research associate at the Dr. Karl Remeis-Observatory. The research continues with high-resolution spectroscopy to confirm the orbital properties of PB3877 and with a photometric follow-up to search for variability. "By finding further stars or binaries on similar orbits would indicate an external origin. Therefore, our quest for similar strangers will continue," Németh said. ESI (Echellette Spectrograph and Imager) is a medium-resolution visible-light spectrograph that records spectra from 0.39 to 1.1 microns in each exposure. Built at UCO/Lick Observatory by a team led by Prof. Joe Miller, ESI also has a low-resolution mode and can image in a 2 x 8 arc-min field of view. An upgrade provided an integral field unit that can provide spectra everywhere across a small, 5.7 x 4.0 arc-sec field. Astronomers have found a number of uses for ESI, from observing the cosmological effects of weak gravitational lensing to searching for the most metal-poor stars in our galaxy. "Therefore, the mere existence of this binary puts pressure on our models and on our current understanding of dark matter in the Milky Way." It puts pressure on models, all right. But our understanding? We had no understanding, because we never detected or know what is dark matter, or even if it really exists. Pressure on hypotheses that are assuming that dark matter exists - that will a be correct statement. How long and how much more "pressure on our models and our understanding" would it require to abandon our models and our understanding of Big Bang cosmology in general? It is long known that some errant stars are running away from the Milky Way at "hypervelocity"! How is it possible unless ejected as a local event? The large and the small Megallenic clouds are also known to move too fast to be long term companion of the Milky Way! I'm sure some sort of dark something or other will be the top candidate. The notion of dark matter as a weakly interacting clump of stuff that travels with the matter is incorrect. Dark matter fills 'empty' space. Dark matter strongly interacts with matter. Dark matter is displaced by matter. What physicists mistake for the density of the dark matter is actually the state of displacement of the dark matter. Physicists think they are determining the density of the dark matter by how much it and the matter curve spacetime. What they fail to realize is the state of displacement of the dark matter is curved spacetime. Yo what the heck is a hot compact star? something 5 times hotter than our star with less mass?? I thought a start needed more mass for that? accretion? If you want to prove the current theories are wrong, the PO comment area is not the place to do it. Try with some conferences. It puts pressure on models, all right. But our understanding? We had no understanding, because we never detected or know what is dark matter, or even if it really exists. This is not pressure on models that say what dark matter is but on those models that say how it is distributed. With the modelled distribution the acceleration of the binary can be predicted (and hence the model is then open for falsification). Do not misinterpret the "put pressure on" as something bad. This is actually exactly the thing scientists are really happy about. Because now they get to test the various hypotheses out there against one another. Definitely. If anyone thinks they can influence scientists by posting here they are proabably also trying to coach sports teams by writing letters to a daily newspaper with a sports section. Jeez. Do you just plug random sciency sounding words together and try to form a sentence? That bunch of gibberish makes no sense on so many levels it isn't even funny. With the modelled distribution the acceleration of the binary can be predicted (and hence the model is then open for falsification). I get the feeling that simply modelling the dark matter without understanding what it is, is like the epicyclic fix to the planetary orbits to keep earth at the center of the universe. It's not wrong, because the planets really do that, but only from a certain perspective. Point being that the epicyclic model wasn't falsifiable until more fundamental information about physics came along, because the fundamental question was elsewhere. Not at all, as I'm comparing the crackpot/dissent phenomena to dark matter effects often. Yeah. And it makes less sense each time. The dissidents live in gravitational shadows of mainstream ideas like the cockroaches. Again: just making stuff up and plugging in sciency words doesn't make it so (much less does it make it science). Again...what does that even mean? That makes no sense whatsoever. You have no clue what you talk about. It could be ejected with central black hole within Milky Way galaxy. But the fact, this system is formed by binary makes the whole artifact doubly intriguing: which binary system would survive such a gravitational slingshot? So it could be a remnant of galactic merger in the past. Indeed, what binary system would survive? More likely, the binary system developed after the slingshot. Such a scenario is again consistent with SQK, since the growing (from within) parent star can eventual eject sufficient new matter to form a companion. (Note the prevalence of binary systems throughout our galaxy.) Thus, this binary system likely developed only after the parent star was accelerated. Anybody else have a current model that fits the unexpected observation, and so many other unexpected observations????? sooooo i did a google search on "hot compact stars" apparently i meant "hot compact cars" cuz there isn't a whole lot out there. I wonder, if the dark matter theory is actually falsifiable. Because it seems to me, that dark matter theory is taking a hit after hit but practically it never gets questioned by mainstream physicists. Never ever, it is like kind of a sacrilege. Odd, nowhere is mentioned the velocity at which PB3877 is moving. 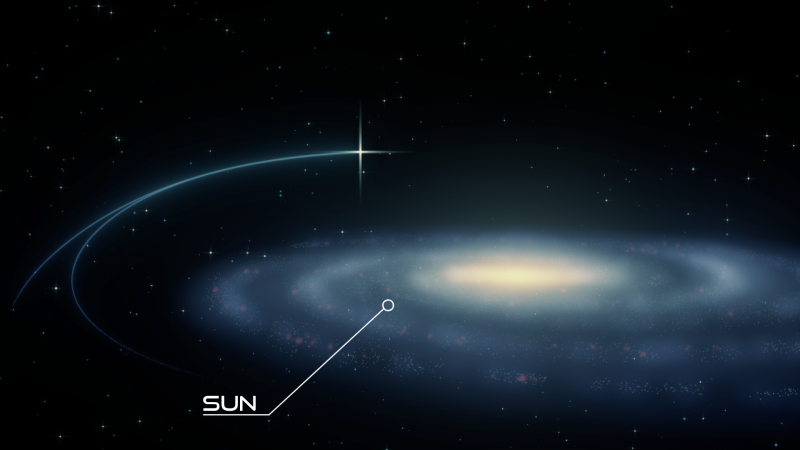 Our Sun is moving at 240 km/s through the galaxy, it would be interesting to make that comparison. Not exactly sure what Escape Velocity from MW is, about 500 km/s or so. How is there a star with half the mass of our sun with a HIGHER surface temperature? I wonder, if the dark matter theory is actually falsifiable. "Dark matter" is a label. It's not a singular theory. It's a label for "that which causes the effects we see which are not explainable by the known properties of visible matter". As such you may see it as a header under which all theories are placed that could potentially explain these effects. I.e. you can falsify individual such theories (and that happens all the time as new data comes in), but the label stays, because the observed effects still can't be explained by effects from ordinary/visible matter. Actually it would be more accurate to say that it is close to the limits of accretion and dark matter models. This could be useful in constraining such models. The title is a bit hyperbolic, if you'll forgive the pun. Yea, its kind of like string theory, it always adapts to new observations without a scratch. There will be always a new subset of individual theories which will fit the data. Consider fire. Someone says: "This is fire. We don't know how it works. Let's start positing theories and test them out"
So they start making various hypotheses and test them. Most of them fail, and as long as none gives a satisfactory answer they start to make up new ones. Does this process of continually disproving individual hypotheses somehow damage the statement "This is fire"? So why would you even expect the lable 'string theory' or 'dark matter' to be damaged? That could only happen if someone came up with another mechanism by which gravitational pull works besides through massive objects (that's why there is a 'matter' in label 'dark matter'). But no one has yet managed that. So, what are the odds that the two stars are not a gravitationally bound binary, but are just in the same line of sight (at available resolution)? Practically zero, since they're so close and since astrophysicists use, you know, spectroscopy to quantify the stars' motion. Yes. The model is only a model of how dark matter distributes itself, and how that makes gravity act. There's no extra machinery (for example explanations of what dark matter is) required, nor are they in the theory. Bah. This wide binary does nothing to constrain galactic dark matter *if* - as seems likely - it's not a Milky Way binary system at all. Under current theory, it *can't* be a Milky Way binary system. It *must* originate from outside of the galaxy, since if it's a native system, the Milky Way can't accelerate it without the black hole at the galactic center. Its trajectory precludes that. I have a sinking feeling that many of the other escape-velocity stars also may have originated from outside the Milky Way. A reasonable conjecture is that the Milky Way is going through a collision right now with a dwarf galaxy. We see individual systems racing through, but dust and nebulas and obscurations prevent us from seeing the big picture. The link I provided talks about the impending collision with Andromeda, a galaxy twice the mass of the Milky Way whose halo has been found to be 1000 times as large as previously thought. If the Milky Way's halo is also larger than thought - it's hard to study that, given obstructions - the collision may already be happening. Or a small dwarf galaxy, independent of Andromeda, could be racing through. I prefer that scenario. The only reason to consider NASA's view of the Andromeda collision is it illustrates just how little we know about what is happening in the Milky Way. It's hard to see the galactic picture from our vantage point. Benni and the other EU proselytizers claim they have. Claims do not equal fact. Claims must be supported by evidence. I claim "unicorns exist". See how that claim doesn't make it fact? I don't buy it but what would be an effect that would clearly discount EU besides Mercury's orbit and the standard model? You mean besides every observation...ever? Search me. I think Captina Stumpy has a very good precis somewhere about everything that is wrong with EU.